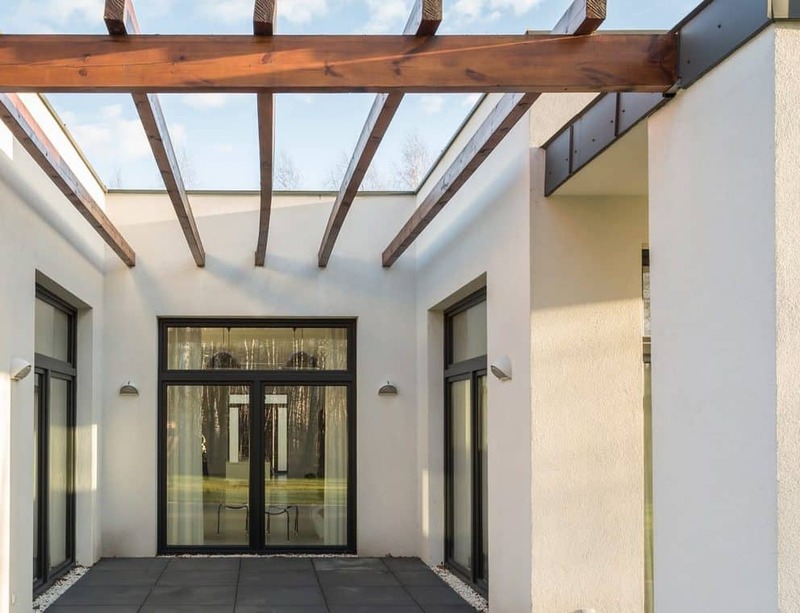 The aluminium doors, windows and curtain walling products from Senior Architectural Systems are some of the most widely specified in the construction sector. The newest product from Senior is the PURe® Commercial Door. Senior Architectural commercial doors are also extensively used in commercial buildings such as schools, shops, offices and hospitals all over the United Kingdom. We review the new PURe® Commercial Door explaining its construction, features and where you can use it. Information about the Senior Architectural PURe® Commercial Door. The PURe® Commercial Door joins the general and patented PURe range from Senior Architectural. This particular series of windows and doors come with the very latest in thermal core technology. PURe uses a high insulated polyurethane thermal core. As a result, the U-Values (subject to glass choices and design details) get down to impressive levels for energy efficient buildings. Furthermore, the PUR thermal barrier is solid. Senior Architectural says that testing profiles with the new PUR thermal core provided better shear testing results compared to some systems with the conventional polyamide thermal break. As well as this, all PURe windows and doors offer a long life span, simple construction and a decent warranty. Casement windows and inward opening windows as well as tilt and turn. Inline and Lift and Slide Doors. So the Senior Architectural PURe® Commercial Door is intended as a heavy duty option to the existing range of domestic products and especially for high traffic buildings. Senior Architectural say this new door offer high performance, many design options as well as suitable for medium and high traffic applications. In addition to this new product come an existing, and widely used range of other commercial doors. Products such as the SD shopfront door, SPW600e, SPW500 and SPW501. All these different systems keep Senior Architectural at the top of the game in the specification and construction market. Uses for the new PURe® Commercial Door. First of all, this new Senior commercial door is not entirely a competitor, to other commercial aluminium doors on the market. By this we mean, commercial doors using a concealed overhead closer. This door is a hinged rebated door opening in or out. Most commercial doors generally come as centre hung doors with a concealed closer and threshold pivot, therefore capable of opening in and out. This does not mean the new Senior door is unsuitable as the main entrance door to a building. It just means that entrances needing double action doors still need to use the centre hung door arrangement. The other range of commercial door products from Senior such as its SFG and SD ranges provide solutions in double action door applications. Both of these are tried and tested, incredibly reliable and offer every feature expected from this type of door construction. We see the new PURe® commercial door as an ideal door as the main entrance to apartment buildings, in any office building needing a single action rebated door and especially in buildings such as care homes, nurseries, retirement apartments and similar commercial buildings also acting as dwellings. Another important consideration with specifying this door is how it sits with the current requirements of The Equality Act, BS8300 and Part M of the current Building Regulations. These standards stipulate specific opening and closing forces for doors in public buildings. The best way of achieving compliance is to provide a door with an automatic opening. Senior Systems does offer this functionality with this new commercial door. You would need any of the face applied automatic door closers, many offering both manual and automatic operation. Above all, this new and highly thermally efficient commercial door is ideal anywhere needing a reliable, high-traffic door. It is suitable as an entrance door, personnel door, fire exit door as well as an access control door. Features and Benefits of the new Senior Systems commercial door. A commercial door needs to meet several additional requirements, over and above a door in a dwelling. With this new door, Senior Systems introduce some expected features as well as some new ones for a high-traffic door. Door sizes up to 1400mm wide and 3000mm high. The first stand-out feature of the door is its impressive door sizes. Most commercial doors with a concealed or face fixed door closer generally come at about 1200mm wide and 2400mm high. The size and strength of the door closer determine most commercial door sizes. For doors without a door closer, free-swinging on hinges, typically 1250mm high and 2500mm high feature with most high traffic doors. Here, Senior Architectural excel, with door sizes of up to 1400mm wide and 3000mm high. The caveat to these big sizes is the locking system fitted. Doors fitted with a panic bar only go up to 1350mm wide and 2500mm high. With panic bar rods restricted on size, this reduced size is acceptable. The same applies to doors fitted with an electronic or access control lock with dimensions up to 1400mm wide and 2500mm high. It is unlikely many public buildings (shops, supermarkets, office blocks etc.) will specify doors at these sizes with user comfort in mind. However, it does allow architects more design freedom in self-build homes as well as other medium-traffic commercial projects needing reliable doors at bigger widths and heights than conventional residential doors. A rebated door with an anti-finger trap stile. The anti-finger trap hinge stile is not a legal requirement, but any sensible professional installer provides it as standard with a public entrance door. The PURe® commercial door also comes with the anti-finger trap hinge stile. You also get floating mullions, a 75mm frame depth as well as the expected choice of midrails and bottom rails. As a result, this door offers nearly all of the options for a reliable commercial door. Above all, these impressive door sizes demonstrate the engineering and peace-of-mind robustness in a door such as this. Senior Systems products are renowned for their reliability and durability, already tried and tested in high-traffic buildings for years. We know many aluminium fabricators love making Senior products. A high performance commercial door with slim sightlines. With maximum weights up to 180kg per door leaf, and with the strong PUR core, these are robust doors. Again they will suit projects where big doors are a design feature as well as suitable for apartment building balcony doors, entry and exit doors or even as part of an impressive entrance lobby. Sightlines are rarely a consideration when specifying commercial doors, and Senior say they have kept these to a minimum, allowing for bigger glass sizes and better views. These doors come as hinged open in or out doors, as a fire exit door with a suitable panic exit device or with a range of electronic locking options. There are three thresholds available, being a fully framed where Build Regulation compliance is not needed, a low threshold as well as a rebated option. Therefore these are ideal doors to commercial developments of apartments. For doors likely to undergo extensive use and even abuse, such as schools, an optional tie-rod protects the bottom rail of the door. This provides a cheaper option to the welded Kawneer commercial door. Thermal, performance and technical specifications. Commercial doors don’t need to meet the same low U-Values and Energy Ratings of residential products. Non-thermal commercial entrance doors continue to get specified in high traffic buildings, alongside polyamide versions. As a result, U-Values are high with a commercial door. Another reason for this is the big range of exit devices, door closers, door entry systems and other door furniture. With a commercial door, functionality such as public safety as well as building security often means a compromise in thermal performance. Senior’s new door with the whole PUR concept offers incredible thermal and acoustic efficiency. Not only are U-Values down to 0.94W/m2K (CEN Standard) possible it surpasses the usually-acceptable 3.5Wm2K U-Value for standard commercial doors. Again this places the product well for commercial developments of apartments as well as any other building where the overall thermal performance is essential. Senior Architectural have added their existing expertise in commercial door systems to this new product too. You get the glass thicknesses up to 60mm thick. Therefore the door works with acoustic glazing, integral blinds, triple glazing and other high specification glass options. Weather performance testing meets the usual BS 6375-1:2009. The door achieves 600Pa for air and water tightness, with 2400Pa for wind resistance. All these are perfectly acceptable for a commercial door product. As expected, security testing meets PAS24: 2016, and Document Q. Do check with your supplier. Security certification entirely depends on what locking systems come with the door as well as the glass. Also important is with what door configuration, Senior tested the PURe® commercial door. As with any door and window, different door configurations all produce different ratings. Do not assume every Senior door design achieves the stated performance figures. Senior Architectural operates an excellent Technical Department to provide the correct information. For specifiers, this new product allows them to choose a reliable and robust door offering more features than conventional doors. The thermal performance makes this new commercial door different from other comparable doors for the commercial sector. Aluk offers the Optio 58BD Entrance Door, the 58BD Flush Entrance Door both hinged doors for the medium-use commercial market. Smart Systems has the Visoline range, although now slightly dated. SAPA Building Systems has the Dualframe 75HP. Comar also has the 7P.i range and specifically the Comar 7P.i ECO Door system. All of these offer reliable doors for the commercial sector but remain polyamide systems. Importantly, not every one of these has the same outstanding U-Values, size capability and glazing range. We see this as an excellent door for anything other than the primary high traffic entrance to a commercial building. Here the established centre hung or automatic doors remain the best choice. However, for commercial doors elsewhere in a building they are new, different and fit for purpose. As expected from an aluminium door, there is a big range of colours as well as several options for door furniture and accessories. Senior fabricators benefit from punch tooling, pre-drilled door cleats and colour coded components. Senior ensure all their products are easy to make and fit. The PURe® commercial door is no exception. 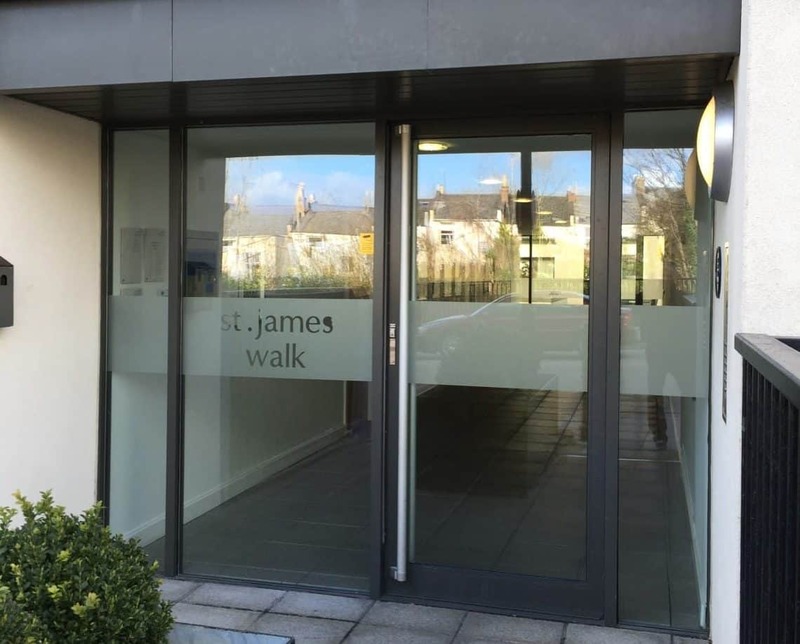 Commercial door installers already offering the broader range of Senior aluminium doors will invariably embrace the product, and it does provide an alternative and very energy efficient door over other commercial door brands.